Health ministries of 12 countries in south-eastern Europe and beyond have endorsed a statement of intent to speed up progress towards the goals and strategic objectives of the European Vaccine Action Plan 2015–2020 (EVAP). Ministers of health and other country representatives embarked on a joint effort in Podgorica, Montenegro, on 20 February 2018, to create a tailored roadmap focused on common challenges and opportunities to increase individual and community protection against diseases like measles, rubella, diphtheria and others. The WHO European Region has made real, but uneven, progress towards EVAP goals and objectives, including measles and rubella elimination. As of the end of 2016, 42 of 53 countries had interrupted endemic measles transmission. However, following a record low of around 5000 cases in 2016, the disease rebounded in 2017, affecting more than 21 000 people. 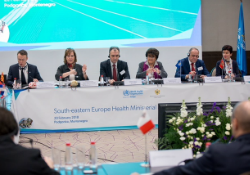 The meeting was attended by the ministers of health or other health ministry representatives from Albania, Bosnia and Herzegovina, Bulgaria, Croatia, Israel, Malta, Montenegro, Republic of Moldova, Romania, Serbia and the former Yugoslav Republic of Macedonia. All endorsed the statement of intent, along with Slovenia’s Ministry of Health, which did not have a representative present. strengthening the role and responsibilities of the National Immunization Technical Advisory Groups. Ministers approved the development of a roadmap that will outline the activities and initiatives to be implemented in the subregion to meet specific strategic objectives. They expressed interest in holding consultations as the roadmap is developed, in partnership with WHO and key immunization stakeholders and donors in the Region. country-specific and joint actions to counteract antivaccination sentiment and stimulate demand for routine childhood vaccination. The outcomes from the Montenegro meeting will feed into the discussion on the mid-term progress review of the EVAP, to be held at the 68th session of the WHO Regional Committee for Europe in September 2018.